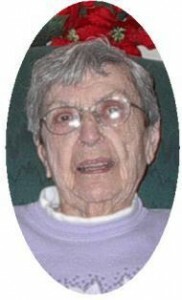 Margaret S. Hommerding, 93,formerly of E. Pier Street in Port Washington died Saturday, September 20, 2008 at St. Joseph’s Rehabilitation Center in La Crosse, Wisconsin. Margaret was an elementary school teacher for over 30 years. She taught at Town of Belgium School for 5 years, the Town of Port Washington Schoolt (Highway KK and Mink Ranch Road) for 13 years and St. Mary’s Catholic School in Port Washington for 13 years. She was a member of the St. Mary’s Christian Women, Catholic Order of Foresters and the Retired Teachers of Ozaukee County. She is survived by her children JoAnn (Arthur) Marson of La Crosse, Wisconsin and Alan (Robert Personett) Hommerding of Chicago, Illinois. Further survived by 5 grandchildren, 2 great grandchildren, other relatives and friends. Preceded by her husband Joseph, daughter Elizabeth “Betty” Keller, 2 brothers and 4 sisters. Funeral services 5:30 PM Wednesday, September 24, 2008 from the funeral home to St. Mary�s Church, Port Washington for Mass at 6 PM. Visitation 3 – 5:30 PM with a 3PM rosary. Memorials appreciated.